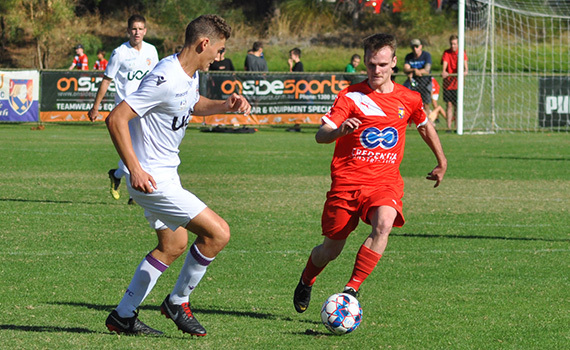 A goal four minutes into stoppage time from striker Luke Salmon has given Perth Glory a 2-2 draw against The Jacks at the ECU Football Stadium on Saturday afternoon. We were ahead early with Czech striker Jakub Sklenar on target, before former Glory striker Joe Knowles added a second from the spot. But Salmon, who came off the bench just before the hour pulled on back three minutes from time, and his equaliser came with the last action of the game. Jacks Head Coach Dale McCulloch was suspended for this one with David Tough in charge on the bench, and they made a number of changers in this one. Keeper and skipper Johnny Perkins missed due to injury, while Lukas De Lima and Josh Whitmore were unavailable, Shane Cassidy was suspended, while Brad McDonald has left the club. In came keeper Scott Wallis, for his first start since returning to the campus, while youngster Ewan Fawcett came in at the back, with Richard Howles coming in out wide, while fellow youngsters George Jackson, Kian McGuigan, Ben Hinshelwood and Harry Edwards were amongst the substitutes. It was a good start from the Jacks and they went close after only four minutes. Henry Durr played Richard Howles in down the right and his shot on the run went into the side netting. But two minutes later we did take the lead. Sklenar and Knowles combined on the right of the box, with Knowles racing past his marker, before his cross-shot was turned home by Sklenar, who had continued his run. It was a perfect start, but Glory looked to hit back immediately and Walter Scott’s curling effort flashed over the top, before former Jacks winger Ethan Brooks shot was saved by Wallis. The Jacks went close to a second on the quarter hour, Andy Higgins’ free kick was flicked on by Sklenar, and Ronald Rixer’s headed was just over the top. Moments later Brooks shot was tipped around the post by the alert Wallis, and just before the break Jacob Italiano’s cross picked out Gabriel Popovic at the back post, but he couldn’t keeper his header down. Just like the first half the Jacks were on the front foot early and Knowles’ shot whistled just wide of the post, but five minutes in they doubled their advantage. Glory lost the ball in the middle of the park and Sklenar pounced and sent Knowles racing clear and as he rounded keeper Jackson Lee he was brought down and referee Josh Mannella pointed straight to the spot and booked the Glory keeper. 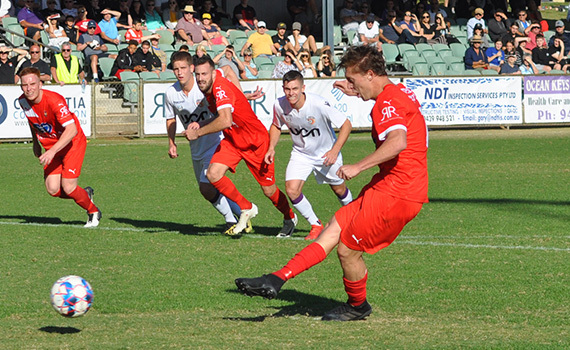 Knowles had missed a spot kick in the last home game against Sorrento, but he took the responsibility and buried it low to the right of Lee to make it 2-0. Glory continued to press but Rixer and Cian Hirrell were outstanding at the heart of the Jacks back four, although Daniel Walsh did have a free header on the hour, but it was straight at Wallis. It was almost 3-0 two minutes later, Rixer’s dink into the box was dropped by Lee, and Howles follow up shot was cleared off the line by Zayd Farah. 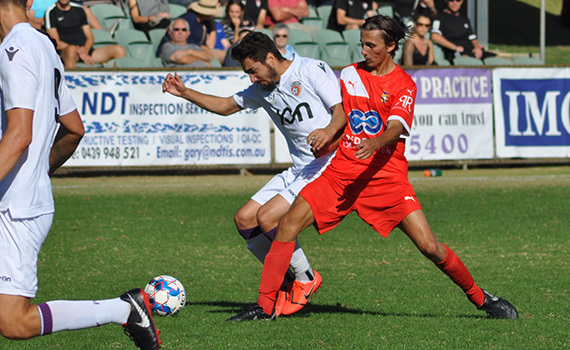 Glory weren’t going away and had the Jacks on the back foot, and three minutes from time they pulled one back. Second half substitute Gomo Dukuly raced down the right and picked out Salmon who side-footed home from close-range. It set up a grandstand finish, the Jacks were defending stoutly and it looked like they had held on but in the fourth minutes of stoppage time Glory found the equaliser. Stynes picked out Brooks down the right and his cross was turned home by Salmon, to give both sides a share of the spoils.